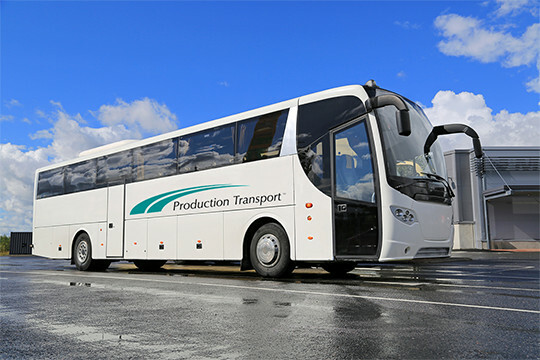 For over three decades, Production Transport has been an industry leader when it comes to partnering with various trade show organizers, special event planners, and convention managers to organize seamless transportation options for guests. While we primarily help organize large shuttle bus services for events with tens of thousands of attendees, we also take care of smaller but just as vital services such as golf cart shuttles and airport transportation. Beyond the fleet of shuttle buses we can organize, we provide key stakeholders with sponsorship opportunities throughout the event. For those looking to make a big first impression, they have the option to invest in full shuttle prints that span the length of as many busses as they want. However, there are also smaller but just as impactful options such as golf cart toppers which can direct attendees to specific locations during the event. We also recognize the need for VIP transportation, which is why we can have a number of vehicles such as luxury SUVs, sedans, or private minibuses ready for your guests. Among the many reasons that we’re chosen time and time again by event planners around the country is because we consistently deliver quality service. We’ll typically begin planning for your event a year in advance. As part of the process, we reach out to key players in the city such as the department of transportation and the police department, among others to ensure that your guests can can where they need to be on time, no matter where they’re headed.